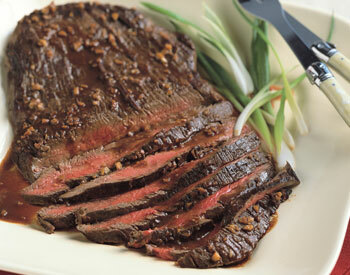 Wedding Flank Steak — Must Have! Here is a story for you. Remember, today is Saturday which is recipe day. OK, here’s the story. I went on a weekend away years ago and one of the guys came with his flank steak already in bags. It had to marinate for 24 hours. I didn’t think much of it, except for that it was impressive that he had done his food work in advance. This was all prior to tasting the steak. OH MY! It was the most delicious bite I have ever taken of flank steak – and that was the sentiment around the room. I asked him for the recipe, of course. He didn’t know. It was his girlfriends mom, and she would not share it with anyone. 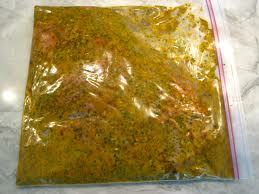 She had prepped the food into the bags to marinate. The recipe came via “AOL,” and I was never happier to hear, “You’ve Got Mail!” It also came with three stipulations which I will share how I have done with below. I promised I would never share with anyone from that city – it’s hard to know where people come from when they follow your blog. I promised I would never tell where I got the recipe – that is why there are no names. I promised to never serve it to anyone from this town or anyone who use to live in this town . . . well, that one was not possible. Here you go! I renamed the receipe, as it had a give away name in the title. So, I now refer to it as the “Wedding Flank Steak” recipe. Put all in blender or vitamix for a bit . . . Score Flank Steak Diagonally. Put steak in zip lock bag. Pour from blender into the bag or bags. Put in refrigerator for the night. BBQ Medium Rare. Hope you have a great weekend! This recipe is served well with Rosemary Red Potatoes and a fun salad. Blessings to you today! I think this exactly what I need! I plan on having other meat options but wanted a beef option as well. Since this will be my first time doing flank steak period, would you give any tips for preparation hours before the event. I know the marinade but how far in advance is too far to prepare the steak? I’m doing my sisters wedding and I want her to have the best experience. Please advsie. I would give it 24 hours. Get it all prepared and put into zip lock backs in the fridge. You will love it. ← The 30 Day Paleo Transformation — It Works!